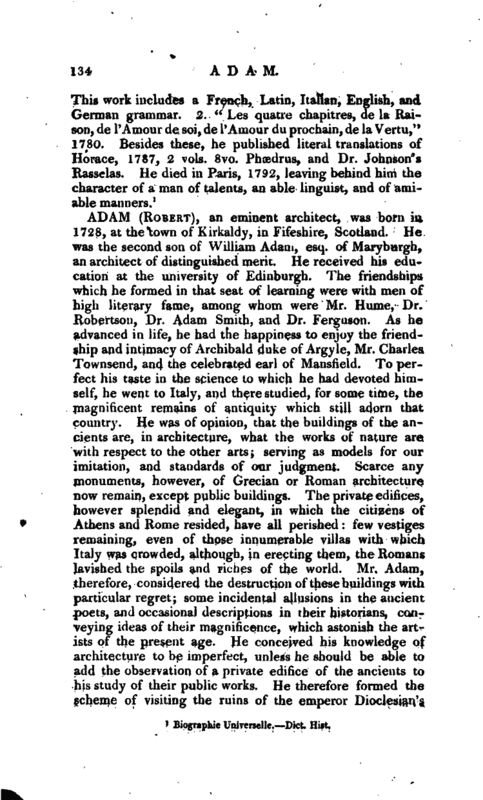 , an eminent architect, was born in 1728, at the town of Kirkaldy, in Fifeshire, Scotland. He was the second son of William Adam, esq. of Maryburgh, an architect of distinguished merit. He received his education at the university of Edinburgh. The friendships which he formed in that seat of learning were with men of high literary fame, among whom were Mr. Hume, Dr. Robertson, Dr. Adam Smith, and Dr. Ferguson. As he advanced in life, he had the happiness to enjoy the friendship and intimacy of Archibald duke of Argyle, Mr. Charles Townsend, and the celebrated earl of Mansfield. To perfect his taste in the science to which he had devoted himself, he went to Italy, and there studied, for some time, the magnificent remains of antiquity which still adorn that country. He was of opinion, that the buildings of the ancients are, in architecture, what the works of nature are with respect to the other arts; serving as models for our imitation, and standards of our judgment. Scarce any monuments, however, of Grecian or Roman architecture now remain, except public buildings, The private edifices, however splendid and elegant, in which the citizens of Athens and Rome resided, have all perished: few vestiges remaining, even of those innumerable villas with which Italy was crowded, although, in erecting them, the Romans lavished the spoils and riches of the world. Mr. Adam, therefore, considered the destruction of these buildings with particular regret; some incidental allusions in the ancient poets, and occasional descriptions in their historians, conveying ideas of their magnificence, which astonish the artists of the present age. He conceived his knowledge of architecture to be imperfect, unless he should be able to add the observation of a private edifice of the ancients fo his study of their public works. He therefore formed the scheme of visiting the ruins of the emperor Dioclesian’s | palace, at Spalatro, in Venetian Dalmatia. To that end, having prevailed on M. Clerisseau, a French artist, to accompany him, and engaged two draughtsmen to assist him in the execution of his design, he sailed from Venice, in June 1757, on his intended expedition, and, in five weeks, he accomplished his object with much satisfaction. In 1762, he was appointed architect to their majesties. In 1764, he published the result of his researches at Spalatro, in one volume large folio: it was entitled, “Ruins of the Palace of the Emperor Dioclesian, at Spalatro, in Dalmatia.” It is enriched with seventy-one plates, executed in the most masterly manner. He had at this time been elected a member of the Royal and Antiquary Societies. In 1768, he resigned his office of architect to their majesties, it being incompatible with a seat in parliament, and he being this year elected representative for the county of Kinross. 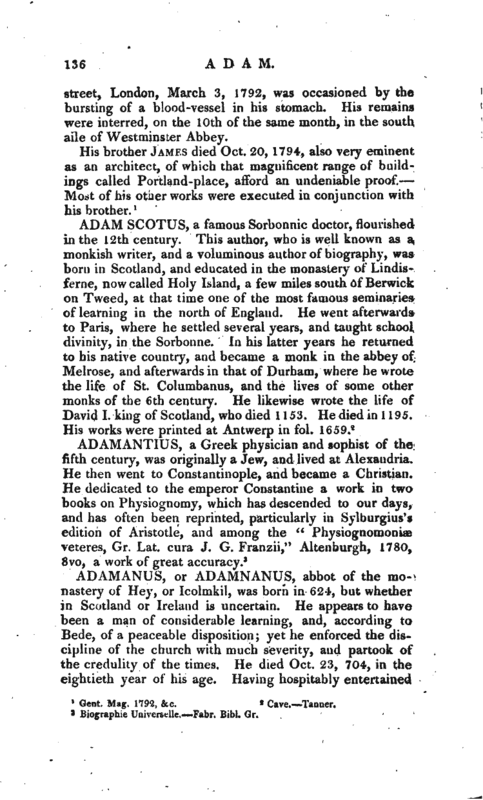 By this time, in conjunction with his brother James Adam, he had been much employed by the nobility and gentry, both in constructing many noble modern edifices, and in embellishing ancient mansions: and, in 1773, they first began to publish “The Works in Architecture of R. and J. Adam,” in numbers, four of which appeared before 1776, and contain descriptions of Sion House, Cane Wood, Luton Park House, and some edifices at Whitehall, Edinburgh, &c. That noble improvement of the metropolis, the Addphij will long remain an honour to the brothers; but, as a speculation, it was not so fortunate. In 1774, however, they obtained an act of Parliament to dispose of the houses by way of lottery. The many other elegant buildings, public and private, erected in various parts of the kingdom by this ingenious architect, display a great variety of original designs. 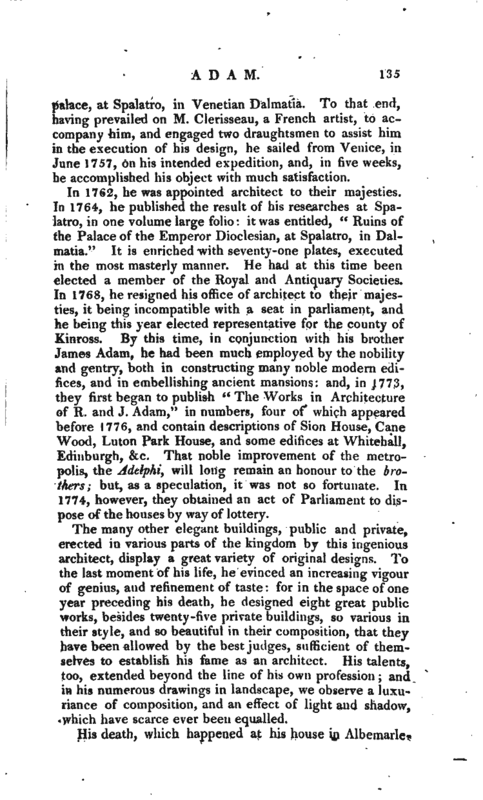 To the last moment of his life, he evinced an increasing vigour of genius, and refinement of taste: for in the space of one year preceding his death, he designed eight great public works, besides twenty-five private buildings, so various in their style, and so beautiful in their composition, that they have been allowed by the best judges, sufficient of themselves to establish his fame as an architect. His talents, too, extended beyond the line of his own profession; and in his numerous drawings in landscape, we observe a luxuriance of composition, and an effect of light and shadow, which have scarce ever been equalled. His death, which happened at his house in | Albemarlestreet, London, March 3, 1792, was occasioned by the bursting of a blood-vessel in his stomach. His remains were interred, on the 10th of the same month, in the south aile of Westminster Abbey.